Demand that Mayor Bloomberg take action (or, at the very least, that he say something) before another New Yorker is unnecessarily run over and killed by a motor vehicle. Someone is killed by a vehicle almost every other day in New York City. Already this year, too many have lost their lives. Help sound the alarm before another life is lost. 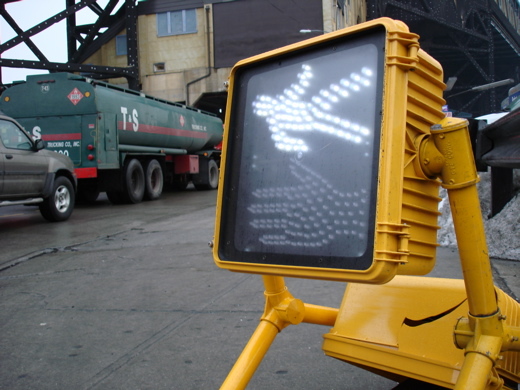 In 2006, over 10,000 pedestrians were hit by cars and trucks in New York City. One hundred sixty-six were killed. The City’s pedestrian safety efforts are inadequate. Where is Mayor Bloomberg? He has spoken out about transfats, gun violence and smoking. If killing a pedestrian with a car was considered assault it would be the second leading type of homicide behind only gun violence. Where is his leadership on this issue? It is well-established that pedestrians are being hit in the same locations again and again. Just 10% of the City’s intersections account for over 50% of all fatalities and injuries. In some locations, such as Downtown Brooklyn, both the design plans and funding have been secured for pedestrian safety improvements, yet the Department of Transportation has failed to implement them. Two weeks ago, four-year old James Rice was killed by a Hummer at 3rd Avenue and Baltic Street in Brooklyn–an intersection that has been slated for safety improvements since 2004. The City knows where the most dangerous streets are, it knows how to fix them and it must fix them without delay. Two nightclub deaths have prompted City Hall to take immediate action to strengthen nightlife safety. Pedestrian safety must be a higher priority than it currently is. Stand with families of crash victims and hundreds of others to voice our outrage and call on the Mayor to prevent future tragedies. You can also help us by passing this announcement on to friends, neighbors and community listservs. This event will happen rain or shine. Children are welcome. If you bring a bike, bring a lock. Bikes are not allowed inside the City Hall gates. Is there a list or a map of the most dangerous intersections in the city? I wish you people all the best. Personally, after my wife’s uncle was mowed down in a hit & run (no one has been caught), my wife and I left the city. 166 dead people don’t vote and don’t have much political clout, I’m afraid. The mayor has been stubborn and the city council can’t be expected to lead. Sad to say it, but I don’t see much happening until the problem gets much worse, and an important celebrity (Paris Hilton, for example) gets hit. Why? Because This Bike [Could Be] A Pipe Bomb, or is there just not that much space? Barry, I recall reading a few years ago that Iris Weinshall’s mother was hospitalized after being hit by a car on Ocean Parkway (Avenue?). Shortly thereafter her husband was hit while riding his bike in LA. Apparently neither of these events spurred her to do much. i understand the need for pedesterian safety and all, BUT one major factor lost in all this is the role of the pedesterian. too many people cross streets yapping on the cell phone, blasting their music from their ipods, and not paying attention, or just defying the traffic laws. it goes without saying they are a lot of unsafe drivers out there, but there might be as many unsafe pedestrians. 2way street on this one. Pedestrians don’t kill people, cars do. Even when pedestrians or bicyclists may be defying traffic laws or limiting their awareness in some way (like by listening to iPods), they are posing no direct threat to anyone. A person driving a car is a threat to people by the mere fact that what they are in control of can very easily injure and kill people. If the car has limited visibility (like not being able to see children over their hood), is unnecessarily large or is sound proofed, the driver is knowingly limiting their awareness of their surroundings and what they might impact (perhaps in a similar way to being under the influence of alcohol while driving). With these factors or if they have music or a cell phone conversation going (even with a hands free device) this is infinitely more threatening to society than in the case of pedestrians. Of course, as an example of far out of whack our priorities have gone, many DOTs actually design streets with the principle that even pedestrians on sidewalks or any objects that might protect pedestrians(like bollards) on sidewalks are dangerous to cars. We forget that the purpose of cities, transportation systems and streets is to serve people, not to serve cars. The demand for cars and for accommodating their â€œsmooth flowâ€ is a political choice that we have made that can be switched on a case-by-case and system-wide basis. DOTs say they are just responding to demand, when in fact they are driving it. The system we have created, that is meant to serve people, is drastically degrading our environment on every scale and is now directly causing more random violence and death than any other source in this city. Traffic issues are generally more predictable and manageable than crime, and just as with crime, patterns of negative or destructive behavior need to be held accountable and prevented from continuing. There is no two-way street here in terms of solutions. Regulating pedestrians would just further feed the monster that we have created, pedestrians that feel safe on their streets is actually part of the solution. It is central to this cityâ€™s success that streets are no longer a place of fear and isolation. The streets of this city need to be returned to the people they are meant to serve. While donâ€™t need a â€œWar on Trafficâ€ like the â€œWar on Crimeâ€ and defiantly donâ€™t need a â€œWar on pedestrians,â€ what we do need is a renaissance for our streets. As you can see, the city hall rally got me feeling it! A very good friend of mine was struck by a car in Queens while he was walking across an intersection. The car happened to be turning right. I grew up in Oklahoma and have lived in OK, TX, TN, and MS. In all of these states, it is against the law to make a right-hand turn while pedestrians have the crossing signal. I can’t believe that in NYC and it’s boroughs, a car can turn right while I’m walking across the street. One thing Mayor Bloomberg should change is making these right-turns illegal in addition to making the cross signals longer to allow more time for pedestrians to cross. They are illegal, Zehavi. But try getting the NYPD to enforce that, with enough presence and persistence to change people’s behavior.